Chandrikaben comes from a family which has practiced Mashru-cotton crafts for generations in the Pattan district of Gujarat. Mashru cotton is known for its characteristic appearance of shining silk with the soothing feel of cotton. However, changing economic times led Chandrikaben, like many others to abandon this craft, and to venture out for a stable job. Gramshree, an NGO based in Gujarat, offered support and helped Chandrikaben get back to the craft nine years back. She spent the first three years just preparing the cotton rolls and learning to work on the equipment. Today, she spins the magic once again and makes fabrics come alive in a dazzle of colors. Gramshree is providing many women like Chandrikaben with a complete ecosystem to revive such traditional crafts - training, raw materials, new-age designs, and critical marketing support. In the last 6 years, under their careful guidance Chandrikaben has not only contributed to the revival, she is now gearing up to establish her own micro-enterprise. Gramshree believes that an ecosystem of such grassroot entrepreneurs will become the catalyst for larger societal change one day. 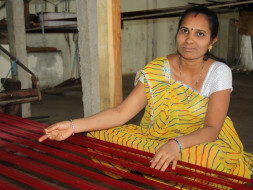 Your loans will help women artisans purchase raw yarn and additional equipment to increase their production. There are a few upcoming exhibitions which seek to showcase these age-old crafts and fabric weaving techniques. The loans will also help partly cover costs of transportation and marketing in the exhibitions.